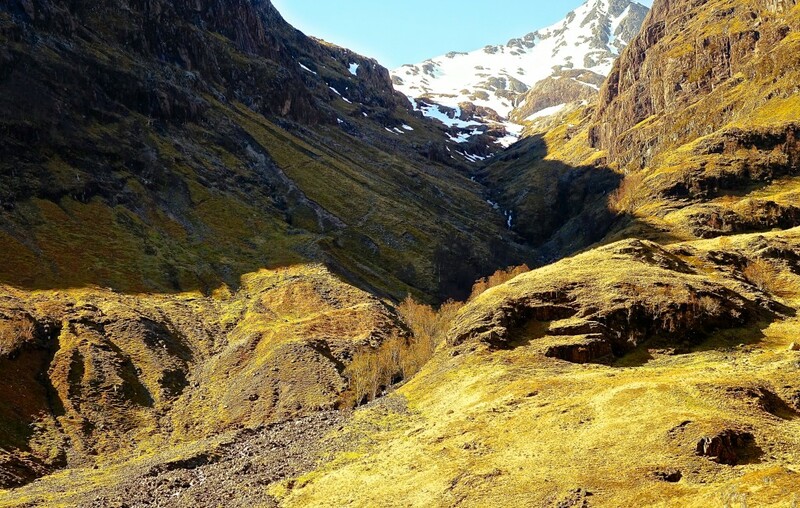 A glacier-carved “hanging valley” in the rugged Glencoe. PORT APPIN, Scotland — Alastair Allward is celebrating a golden anniversary this year, but he’s not getting much back from his love. That’s how it goes with 700-year-old castles – strong but silent types. Dominating an islet near the village of Port Appin, this somewhat forbidding structure bears the marvelous name Castle Stalker (Gaelic for falconer, or hunter). A tour of Stalker is prime among the lures beckoning visitors to leave the two-lane A82 through the Scottish Highlands and to stay awhile. But first, step ashore from the pontoon boat piloted by Allward for a walk through Castle Stalker. He and his siblings inherited the castle from their father, D.R. Stewart Allward. While a WWII POW, the senior Allward had kept his sanity by planning a future he was determined he’d live to see. The plans included having four children – he did – owning a Rolls Royce – the successful lawyer did – and buying a castle — he purchased the uninhabitable Stalker in 1965 from a member of the venerable Stewart clan. Is the Holy Grail about? The castle’s wee island is in the Highlands’ Loch Linnhe. 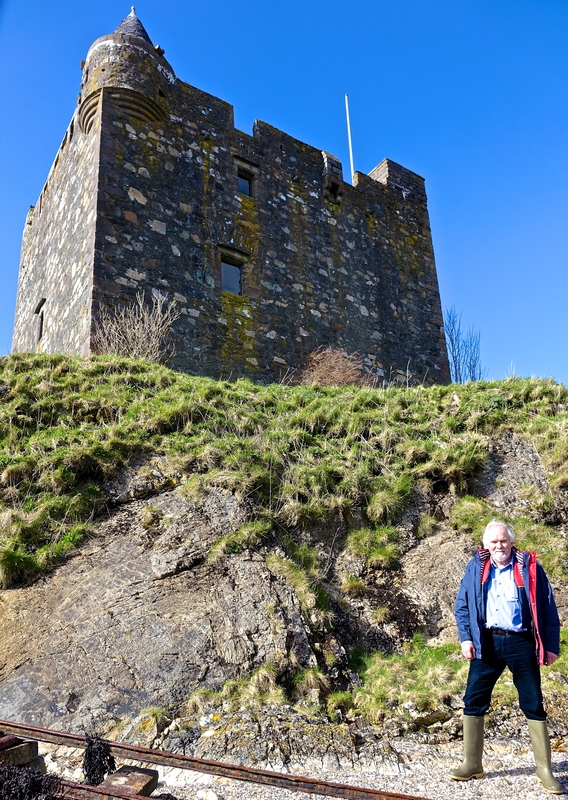 On his tours, Alastair Allward, above, in front of the castle, recounts the centuries since the castle’s creation, most likely in 1320, and numerous changes of ownership due to warring between Campbells and Stewarts. Both were featured in a memorable scene in 1975’s madcap Monty Python and the Holy Grail. Stalker stands in for a French castle visited by King Arthur and his squire. The castle was rented for 50 pounds for one day’s filming, discloses Allward, who adds that he was paid 5 pounds to be one of the knights on the ramparts ridiculing the king. A publicity still displayed in the castle shows Allward in chain mail and helmet, thumbs to his ears as he waggles his fingers at Arthur. Silhouetted against mountains and tall hills on the nearby shorelines, Stalker is often typecast as a symbol of the historic Highlands. It comes alive with Allward’s narration – 10 years of part-time renovation work produced a new roof, electrification, two modern bedrooms and a bathroom (only Allward relatives use them). While the décor is now period pieces and reproductions, Allastair Allward is an original. Time spent with him at Stalker is typical of the region – charming, spilling over with historical tales – which is an easy drive west from Scotland’s largest city, Glasgow. You can see but not tour another castle, older than Stalker, on an hour-long boat trip out of Port Appin. Duart Castle, pictured as Sean Connery’s hideaway in the 1999 film Entrapment, is on a bluff on the island of Mull. The captain slows the boat and passes around binoculars the better to view red deer, the occasional sea eagle or seals lolling on a shore. Just a few miles up the coast from Port Appin is Oban, which has just 8,200 residents but is the second-most populous town in the Highlands. Oban is a busy port for ferries to the islands of Mull, Islay and Skye. Providing a superb view of the harbor and town is its hilltop landmark, the circular McCaig’s Tower. That man, a banker, commissioned the structure, about 660 feet around with 94 arches in its wall. Its hilltop site is 220 feet above the harbor and main commercial street. McCaig died in 1902, before his grandiose plans for statues of his family within the center were completed. Instead, its interior garden is the scene of weddings, picnics and kids running around. About the time your trip north on the A82 causes one flock of grazing, black-faced sheep to merge into the next, there appears a loch – Gaelic for lake – or a snow-topped mountain: the U.K.’s tallest at 4,409 feet, Ben Nevis dominates the horizon at one point. 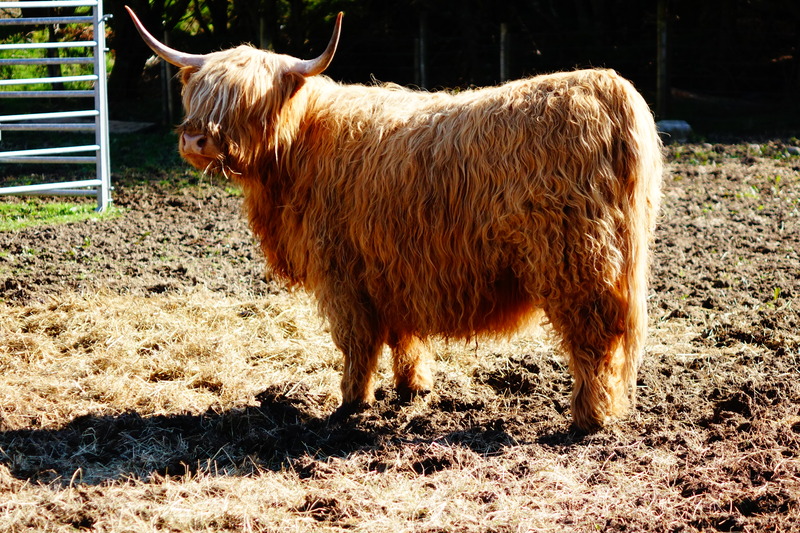 More interesting than the sheep are the Scottish cows –“coos’’ in the thickest local accent – whose hair hangs over their eyes like shaggy bangs. The coos are universally nicknamed Hamish, and miniature coos are a staple in souvenir shops. So, too, is a Scotch whisky sampler. But to cut out the middle merchant, Highland travelers can browse through distilleries such as Glengoyne. There, they can even blend their own 7-ounce bottle after tasting five different 16-year-old distillations. During this tour – it begins with a “wee dram’’ and toast before a video of the distilling process — visitors learn why Glengoyne’s Scotch lacks the smoky flavor traditional in most of the nation’s whiskies: The germinating, wet barley is not dried over a fire of peat. Rather, Glengoyne’s 60 tons of barley used weekly dry when spread 5-8 days on a floor heated from below. But smoke is the desired element at the Inverawe Smokery. Although health laws prevent visitors from entering the production facility, a series of displays and miniatures explain what takes place just over the adjacent hill. Manage this stop so you’ll have an appetite to sample, in the Smokery’s café, four kinds of salmon and smoked eel, prepared by methods you’ve just learned. You also will have learned that about 95 percent of the Scottish salmon served in restaurants and sold in stores is from fish “farmed’’ in pens. Too few wild salmon are now available, though anglers catch them occasionally in the adjacent river Awe. The name of the Smokery, Inverawe, is from the Gaelic inver, meaning mouth of the river. A loch serpent, you say? You’ll get far broader water views elsewhere driving through the Highlands, where brilliant yellow gorse bushes steal the scene from all but the largest landmarks such as Loch Lomond. While Lomond is the largest lake in Great Britain (24 miles long, up to 5 miles wide) and may be renowned in song for its “bonnie, bonnie banks,’’ it is far from the most-famous lake. That would be Loch Ness, farther north. The A82 also parallels Ness’ 23 miles of shoreline. Sightseeing boats, the passengers on the lookout for the famed Nessie, patrol the lake first reported in 1933. Presumed to be a remnant from the age of dinosaurs, Nessie’s existence has never been verified despite more than 1,000 tales of sightings and several scientific searches. The ruins of Castle Urquhart, on the shore of Loch Ness. 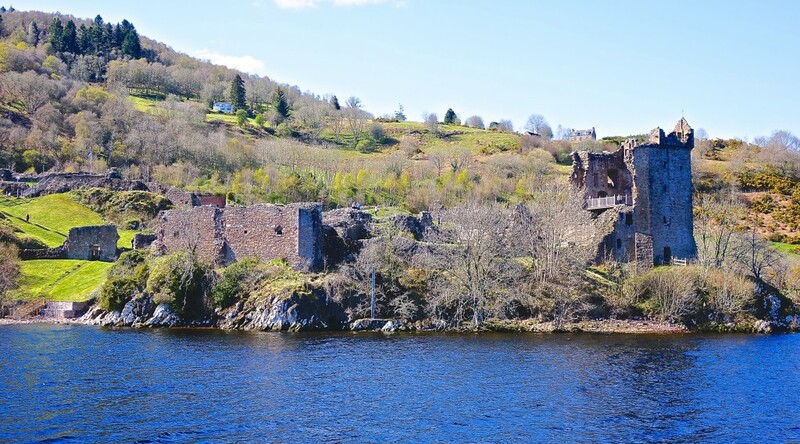 Still, the sightseeing trip is a fine break from the drive, and the boats pass the hauntingly picturesque ruins of Urquhart Castle. Far larger than Castle Stalker, some of Urquhart is also older, dating to the 13th century. Urquhart draws hundreds of thousands of visitors to walk about the ruins each year. But Urquhart can’t come close for oohs and ahhs to Glencoe, a national reserve originally formed by volcanic eruptions an estimated 420-million years ago. That landscape would be repeatedly scoured by glaciers, until 12,000 years ago. Driving north or south in the Highlands means traveling through Glencoe, 22 square miles of massive hills separated by glacial valleys dotted by small lochs and streams. A view down such a valley, where purple heather and gorse liven the green hillsides, is one of the lures for 2.5-million visitors to Glencoe annually. Mostly they come to trek miles of trails, to train on their bicycles at elevations, to paddle canoes or to challenge rapids in kayaks. Birders and campers spend days in less-demanding pursuits. Some simply buy a few hours in an off-road vehicle driven by a ranger. Taken together, the rugged beauty of Glencoe, whether under a brilliant blue sky or the scudding clouds bringing Scotland’s iconic storms, is a symbol of the allure of the Highlands. A traveler photographs one of the Highlands’ iconic landscapes. Getting There: Flights from North America to Glasgow usually involve a change of planes, typically, in London or Amsterdam. Getting Around: Rental cars are available at the Glasgow airport, but you’ll enjoy the scenery much more if you don’t have to concentrate on driving on the “wrong’’ side of the car and on the “wrong’’ side of the road. The answer is to hire a car service. The drivers will also narrate the trip, so that you can learn about the Highlands culture and history even if you are not stopping at a specific place. 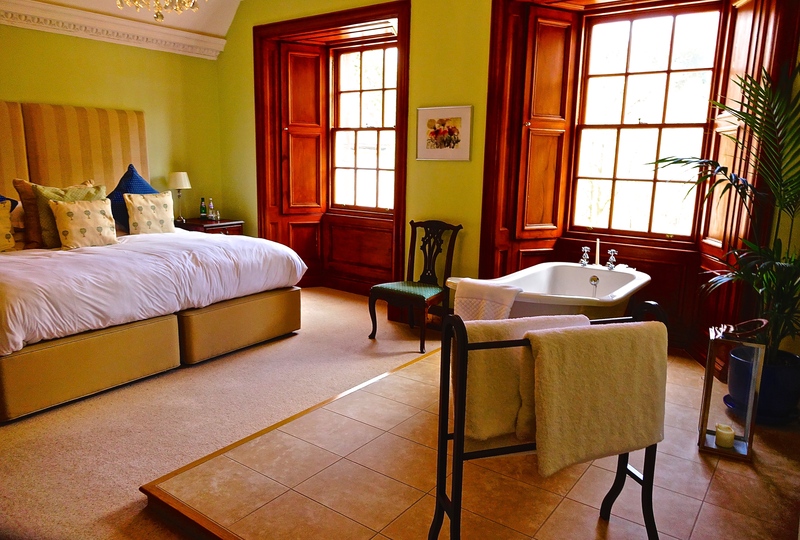 Staying There: There are numerous B&Bs and both small and chain hotels throughout Scotland. But you can add memories to your trip by paying more to stay in places you aren’t likely to encounter back home — manor houses, grand hunting lodges, lakeside resorts with their own golf courses, in-town boutique hotel, even a former royal yacht. Ever stayed in a 6,500-square-foot hotel suite? 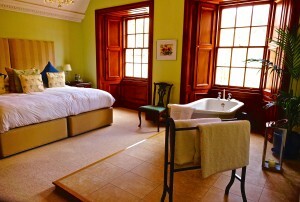 Below, a guest room in the splendid Glencoe House. Those are all available in the consortium named Connoisseurs Scotland. It is a collection of 27 properties – not only Queen Elizabeth’s former yacht the Hebridean Princess, but also the renowned Royal Scotsman train. The 27 properties offer something for everyone’s taste – tennis, golf, horseback riding … falconry, anyone? Most of the properties are in out-of-the-way places and so pride themselves on their fine dining. Castle Stalker: Times of tours are subject to the tide and are generally one per day, on most days, April-October. Those with mobility issues will not be able to visit the upper floors. Check availability www.castlestalker.com. Adults are £19.50, 16 and younger is £9.50, a family ticket (two adults, two children) is £50. Glengoyne Distillery: Still using part of the original 1833 facility, the distillery is about 14 miles north of Glasgow near Killearn, on the way to the Highlands. It offers a range of tours, starting at 45 minutes for £8.50 a person, to the six-hour Master Class (tasting five whiskeys, five sherries, tour of the warehouse, lunch). The blend-your-own Malt Master tour is just under two hours and costs £55; you’ll leave with a boxed seven-ounce bottle of your favorite blend. www.Glengoyne.com; reception@glengoyne.com. Inverawe Smokery: On the way to the Highlands form Glasgow, Inverawe is a bit more than an hour’s drive, into the gorgeous countryside – indeed the Inverawe property includes walking and nature trails and picnic areas. Get a pamphlet when you enter the smoking exhibition building for a complete explanation – learn why the fish must first be cured in salt, and the difference between “cold’’ and “hot’’ smoking. This self-guided tour is free. The café and gift shop are next door. www.smokedsalmon.co.uk, info@inverawe.co.uk. There is a charming video on YouTube, with Rosie’s husband, Robert, narrating; that’s Rosie autographing her cookbook. Appin Boat Tours: The one-hour castles and wildlife trip (you’ll also circle a lighthouse designed by Robert Louis Stevenson’s grandfather) leaves from the tiny wharf at Port Appin. You might see puffins, otters and dolphins. The boats can carry up to 12 passengers and generally make this trip twice a day in the summer. Fares are £20 for adults, £15 for 15 years and younger. http://AppinBoatTours.co.uk, info@coastal-connection.co.uk. Glencoe Visitors Center: A modern museum and information area, with a cafeteria. Is about 35 miles north of Oban, near the town of Fort William. This is the place to get information on the walking, climbing and cycling routes, history of Bonnie Prince Charlie and the Jacobite Rebellion, and just great spots to stop for photos. www.glencoe-nts.org.uk, or www.discoverglencoe.com. I’ve spent most of this (dreich) morning perusing your writings and photos. Very enjoyable. Glad to see that the storms have abated and that the clearing up process is going well. We are 600 feet up as you will remember and feel very safe. Some residual winds from the Atlantic but nothing bothersome. Best regards from Nancy and me.